As far back as I can remember, my Papa involved me in cooking projects. He’d arm me with a paring knife so I could help prep, or he’d drag a chair to the stove so I could stir. I loved squishing meatball mixture through my tiny, chubby fingers. I got really good at pleating gyoza. One of the all-time favorite recipes we made as a family was Merry Mix. He’d pull out the enormous, commercial-kitchen-size stainless-steel mixing bowl and plunk it on the table. (When I say this bowl was enormous, please understand I could sit in it and sled down a hill. And I did. We had to take all the racks out of our oven and bake it with the door slightly ajar because it scarcely fit.) I’d open all the bags and boxes and dump everything in, mixing gently with my hands. Papa always claimed Merry Mix was “an old Moore family recipe,” but I know he’s modified it over the years. In the ’80s, we sometimes included Bugles. My brother, Matthew, has had good success experimenting with new ingredients, including one notable version using wasabi peas. I’m a traditionalist and make it the same way every time, just the way we did in that giant steel bowl when I was really little, but I have some suggested modifications down below in the notes. Use the whole box/bag of each component. Why have leftovers? Use a whole pound of butter (melted). Yeah. Four sticks. Use a whole bottle of Worcestershire sauce (the big bottle) because it’s delicious. Use plenty of seasonings (garlic powder, onion powder, celery seed, paprika). Bake on low heat (between 200 and 250ºF, depending on how often you want to have to stir) for the better part of a day. As the Merry Mix bakes, gently fold the mixture with a wide, flat spatula, coming in from the edge of the baking dish to avoid breakage. Yes, it takes forever. Yes, your house will smell absolutely amazing. Yes, the yield is a little over three gallon Ziploc bags. Yes, you may have to use multiple baking dishes to contain all of the magic. It’s worth it. We tend to eat Merry Mix at Christmastime these days, and since Mike’s parents are coming to visit, I knew I had to make some for our cozy nights at home. This year I also made a smaller batch gluten-free (I left out any ingredients that contain wheat—Wheat Chex, pretzels, Cheez-Its) in a 9×13″ dish, which I microwaved for several minutes. That worked, but you have to open the micro and gently stir every minute, because if you wait too long your dish will get hot spots and completely char some of the ingredients. Ask me how I know. For the record, I still prefer the oven method. I think the low-and-slow baking leads to deeper flavor, I just didn’t have any more room in my oven. 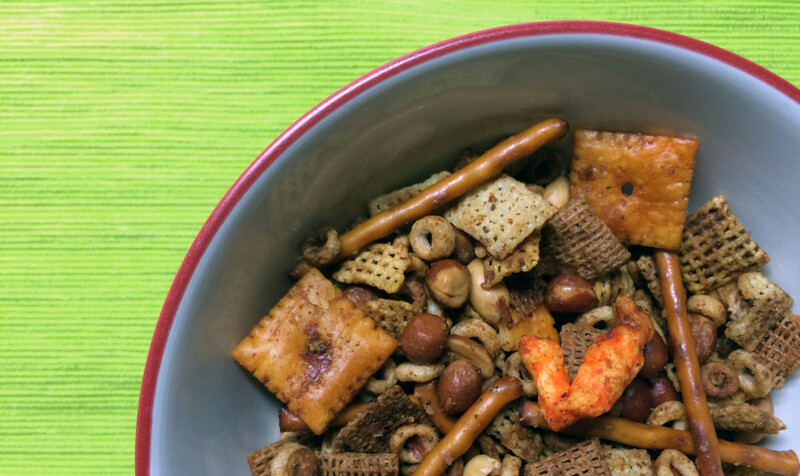 Merry Mix is a great thing to make in the fall/winter when houseguests are plentiful, and it makes a killer road trip snack in the summer. I hope you’ll give Merry Mix a try. You won’t regret it. Preheat oven to 225ºF. Toss all cereals and snacks into a very large vessel or two (I use a roasting pan and a very large baking dish). Using your hands, toss gently so mixture is randomized. Over low heat, melt butter. Stir the dry spices together in a small dish. In three to four additions, top with the melted butter, several liberal glugs of Worcestershire, and a generous pinch of the spices over the top of the mix, stirring gently to combine between additions. Taste, and if it needs more of any of the spices, sprinkle a bit extra on or add some seasoned salt (Worcestershire sauce varies in saltiness, as will your dry ingredients). Bake in oven, folding gently with a wide spatula every hour or so to bring the wetter ingredients at the bottom of the pan up to the top. Merry Mix is done when all pieces are dry and crisp, four to eight hours; you’ll have to taste some of the most well-saturated pieces to be sure. Shallow dishes will dry out faster than a deep roasting pan, so one pan my finish before the other. Allow to cool (I often leave it in the oven to cool overnight as the oven cools down), then store in gallon-sized zip-top bags. Optional mix-ins: Crispix, mixed nuts, Goldfish or Bunnies crackers, wasabi peas, sesame sticks, broken pita or bagel chips, Fritos, Bugles, red pepper hot sauce (such as Frank’s Red Hot). If you add a bunch of extra stuff, think about leaving something else out to compensate (or increasing the butter/Worcestershire/seasonings). I didn’t note a size for the cereal boxes and the Worcestershire sauce because sizes vary within stores, brands, and regions and because you may or may not use all of what I’ve called for above. In general, if you have a choice, use the “normal” box for all the cereals, not the giant “family size” boxes. For the Worcestershire sauce, that’s personal preference. I like to use the large bottle that Lea & Perrins makes, but I’ve used smaller bottles before from all sorts of other brands (like Whole Foods’ 365 or Annie’s or Kroger’s) and the Merry Mix has come out fine. If you dig Worcestershire like I do, get the bigger bottle (or two little ones). Some Worcestershire sauce, such as Lea & Perrins, is not vegetarian because it contains anchovies. If you’re feeding any vegetarians, purchase an appropriate bottle of Worcestershire sauce. Many inexpensive grocery-store house brands are vegetarian. If modifying this recipe to be gluten-free, wait to add the GF pretzels until after the mix has baked and cooled. Thanks to their composition, GF pretzels do not hydrate and crisp up again the same way traditional pretzels do. I have to say – I have been searching for YEARS for something that would resemble the Nalley company’s snack of the same name – Merry Mix. I wrote the company and they were vague about any details, just saying it had been discontinued. This sounds very similar, and I will be making a vat of it this weekend! Thank you so much!! !